In contrast to widespread assessments that family enterprises lack sufficient resources and capabilities to go global, many family companies are competing successfully in an increasingly globalized business environment. Worldwide, a large number of thriving multinationals are still family-owned and/or under family control. While there is abundant literature on the phenomenon of globalization from many different disciplines, neither the literature on multinationals nor the growing field of family business studies have systematically investigated family multinationals yet. 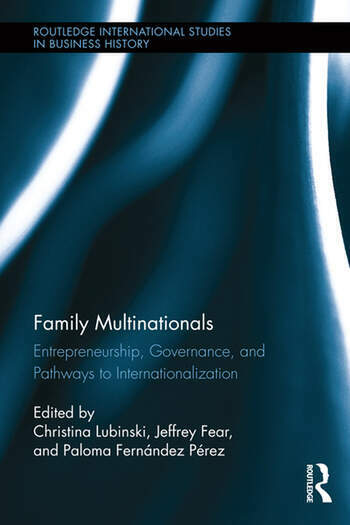 This volume is one of the first to deal explicitly with family multinationals and the role of the family in internationalization. It situates itself at the crossroads of internationalization studies on the one hand and family business research on the other. Why do families continue to play such a large role in some of the most prominent firms in emerging and mature economies? How did they manage to maintain ownership control, yet divest of unrelated business ventures? How did they internationalize yet maintain control? This book identifies the idiosyncratic strategies and structures of family multinationals in different countries and at different points in time. A comparative historical and case study approach allows us to explore the role of the family through the firms’ various internationalization pathways and understand long-term developments and path dependencies. Jeffrey Fear is the newly appointed Professor of International Business History at the University of Glasgow, Centre for Business History. He holds a PhD in history from Stanford University and has previously taught at the University of Pennsylvania, the Harvard Business School, and the University of Redlands. He is on the editorial board of the Business History Review and Essays in Economic and Business History. Paloma Fernández Pérez is Professor of Economic History at the University of Barcelona and has a PhD in history from the University of California at Berkeley. Her research interests are family business, innovation, entrepreneurial networks, and lobbies. She has published El rostro familiar de la metrópolis, and Un siglo y medio de trefilería en España, and has edited Del metal al motor with P. Pascual . She is a principal researcher of a project on entrepreneurial networks in Spain and a member of the Centre d’Estudis Antoni de Capmany. Christina Lubinski is Research Fellow at the German Historical Institute in Washington, DC. Her first book won the Prize for Business History by the Germany Society of Business History and she was a Harvard Business School Newcomen Fellow in 2010–2011. She has published on family business and multinationals in Business History Review, Enterprise & Society, and the Journal of Family Business Strategy. Her most recent research deals with German and U.S. companies in India since 1900 and asks how they dealt with the challenges of political risk.